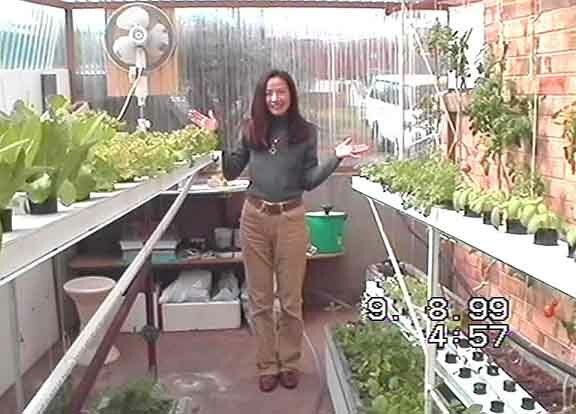 Motoko is showing you the delicious letters and herbs that we have grown from seed in just two weeks. 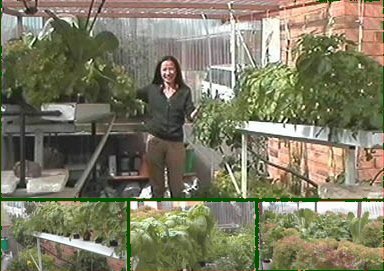 Bruno's Greenhouse is modular and can be configured in many sizes and dimensions. Whether you live in a small apartment or a large house ...... anywhere at all, Bruno has the right greenhouse for you. For quotes and more information please e-mail Bruno. GO TO MY WORK "THE RUSSIAN AERO-MARINE"
BACK TO "DESIGNS AND PLANS"
You can almost see the vegetables growing in front of your eyes. The following pictures were taken two and a half weeks since the above, meanwhile our greenhouse has been feeding several families and we have sold some of the herbs and leaves to delicatessen shops.